I apologise to those of who will find out this way, rather than from me directly, about my mother’s death a couple of weeks ago. In any case, please take some time to read this obituary for an extraordinary woman. Jean was born 1941 and brought up in Acocks Green, a suburb of Birmingham. She was the eldest of three daughters, with Pam and Gill, to their parents, Fred and Edna Aldridge. After completing her examinations at King Edward VI High School for Girls in Birmingham, still one of the best and most famous schools in the country. Jean went on to study medicine at Newnham College, Cambridge, from where she graduated with a first class degree. Her clinical training took place at the London Hospital, Whitechapel, where she later held house officer posts. In an era when few women were accepted to train as doctors, it is notable that Jean won prizes in anatomy and surgery while studying at the London. She remembered the East End as an exceptionally hard place to live, ruined by the Blitz and riddled with crime and poverty. This was the era of the Kray brothers and, indeed, it differed little (though was significantly more grimy) from the East End described in the current BBC series, Call the Midwife. While undertaking her initial studies in radiology at Vincent Square, London, she met her future husband John Guy (through old Oxbridge connections) and after marrying, went on to complete her specialist training in radiology at Cardiff Royal Infirmary and University Hospital of Wales, as John was a curate at that time in his home city of Cardiff. Jean and John spent some years in this part of south Wales. After leaving Cardiff, they lived in Rudry, just to the north of the city. During their time there, Jean developed a love and appreciation for rural Wales which she would maintain throughout her life. She combined her early medical career with involvement in the life of the Parish and local cultural activities such as participation in the establishment of the Lower Machen Festival. Jean was appointed consultant radiologist at the Royal Gwent Hospital, Newport in 1973, living in John’s parish of Devauden with Killgwrrwg and Wolves Newton. She gave birth to her son, Richard, in May 1975 and stayed at Devauden until 1979 when she moved to Yeovil District Hospital, again as a consultant radiologist. Jean was Clinical Tutor for five years in Yeovil, involved in General Practitioner training as well as continuing medical education for hospital staff. In 2012, the majority of medical students, by a small margin, are women ; even as recently as 1981, it was depressingly rare for women to hold senior medical positions and it is notable that she was the first female doctor to be appointed as a consultant at Yeovil District Hospital. Jean and John remained in Somerset until 1993 when Jean took a period out of work and John returned to work as a parish priest in Bettws Cedewain, Montgomeryshire. For a few years, Jean worked part-time at Bronglais General Hospital Aberystwyth. 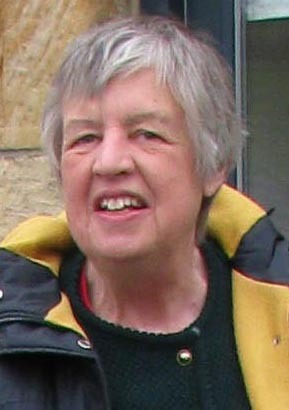 After her separation from John in 1997, she worked at several hospitals in England and Wales as a locum, including the Robert Jones and Agnes Hunt Orthopaedic and General Hospital, Oswestry, where she lived briefly. At the turn of the millennium she moved to Lavenham and spent three years working in the West Suffolk Hospital, Bury St Edmunds, retiring in 2001. Since 1980 Jean had been engaged in research in the history of medicine, and chiefly in the history of diagnostic radiology in Britain. The centenary year of the discovery of X-rays in 1995 involved a considerable effort in helping with exhibitions and lectures. She was for nine years the secretary of the Radiology History and Heritage Charitable Trust and advised and helped with the establishment and management of a number historical collections in several parts of Britain, latterly including the Suffolk Medical History Society. She was frequently involved lecturing at radiology and history conferences and was elected President of the History Section of the Royal Society of Medicine, of which she was a dedicated member ; she was enormously proud of this appointment, a role she carried out despite concurrently undergoing treatment for cancer. She contributed also to the Society of Apothecaries, again in her capacity as a medical historian. Her interest in medical history extended beyond radiology and she was in a small way an expert in 17th century medicine in England, focused on the work of Ralph Bathurst, theologian and physician, a contemporary of Sir Christopher Wren in Oxford. Jean completed an MD thesis in the early history of diagnostic radiology at the University of Cambridge. In the UK, the MD, the medical equivalent of a PhD, is a very rarely awarded degree, especially at Cambridge. She was one of very few women to have received an MD from Cambridge, ever. It was a crowning achievement in a dedicated academic career but one that she wore very lightly and modestly seldom made much of. Jean’s retirement from the NHS did not at all imply a slackening in her activity. She threw herself enthusiastically in to the life of the village and the life of the Lavenham benefice in particular. Jean joined many of Lavenham’s clubs and groups, and was very enthusiastic about the walks, the bird and flower watching and counting that takes place (reflecting her life-long interest in natural history), photography, needlework, local education (both her own and at the village primary school where, most recently, she participated in the “Open the book” project, enacting scenes from the Bible). Jean was here, as for most of her adult life, deeply committed to the life of the church, in Lavenham and Preston. Early on, Jean sang in the choir and, when she found singing became more difficult, continued supporting the choir where she could. She even devoted some time to completing a study of the stained glass in Lavenham Church, which is still available from the Church shop. Jean loved Lavenham and loved the people of the village and the area. It was no surprise that Jean undertook the training to become a Reader in the Church. In the recent long inter-regnum before the Rev Stephen Earl arrived, Jean devoted significant energy to keeping worship and church pastoral duties running as actively as she could, supporting the visiting and retired clergy, the Wardens and many others. Jean became a skilled Preacher and, again, some copies of her sermons, prayers and reflections are to be found at the back of the church. As with everything else in life, she set about the work of the Reader with a quiet and devoted diligence. Jean Guy was many things to many people. She was a deeply moral person but by no means politically conservative. She was a torch-bearer for equal rights for women without adopting political feminism. She had an unshakeable sense of social justice and, perhaps more privately, expressed few positive opinions about the state of Political leadership in this country. She believed in social duty, in medicine and in local participation. She was an environmentalist and a pacifist, a generous (and as always discreet) supporter of the arts. She was a devoted mother and sister and an unfailingly loyal wife. She was, in every sense and every way, a true and loving Christian. She will be deeply missed by all who knew her.